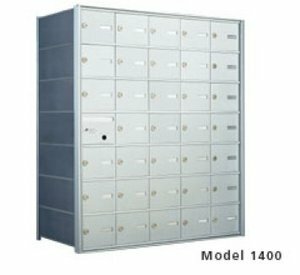 Auth-Florence 1400 and 1500 Series Horizontal Mailboxes are designed for use in larger multi-family apartment buildings, dormitories, office highrises, etc. They are constructed of heavy-gauge aluminum. Front-loading boxes require one compartment to be a master door for Postal Service use. Rear-loading boxes require a rear cover. All horizontal mailboxes are recessed mounted.